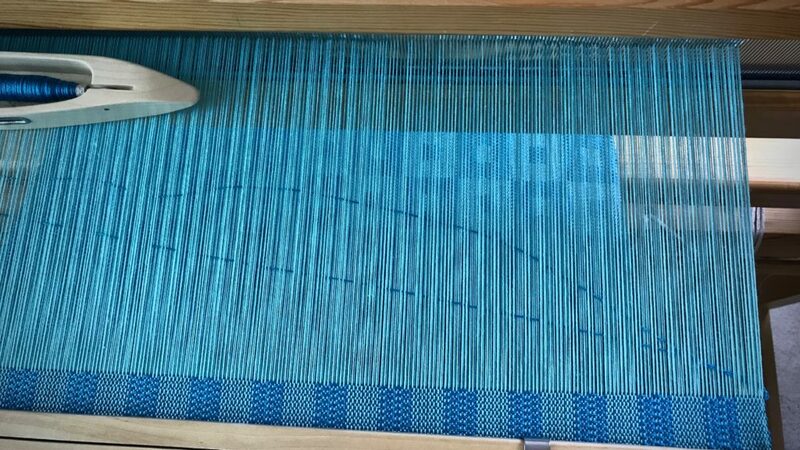 The first time I wove fabric that required a doubled weft I did not use a double-bobbin shuttle. I didn’t own one. I used a regular boat shuttle and sent it across twice, going around the outer warp end. Those first thick and thin towels came out beautifully. So I know it can be done. Square pattern peeks through from below. 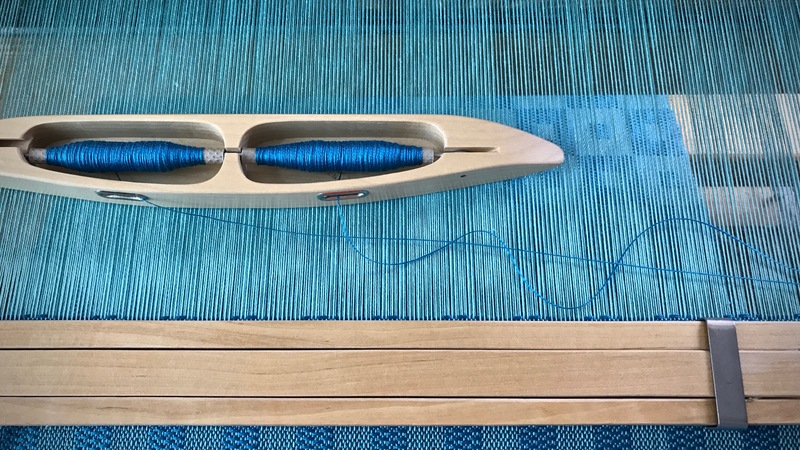 Double-bobbin shuttle carries the doubled tencel weft for this kuvikas fabric. 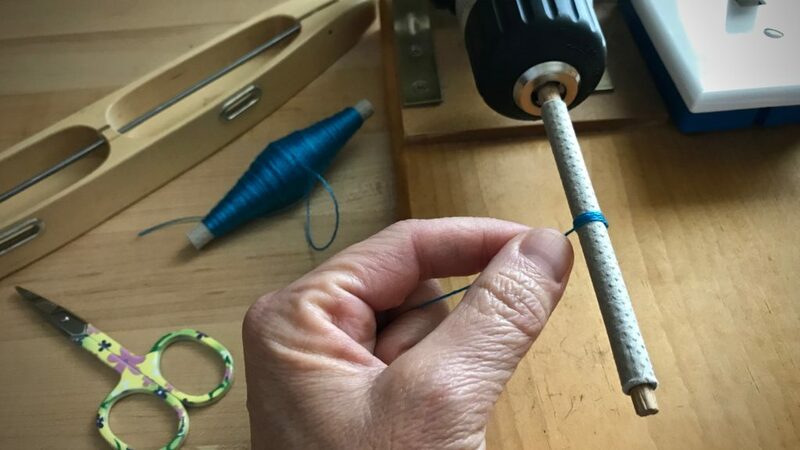 The first time I used a double-bobbin shuttle I wondered if it was worth it. It was awkward and clumsy in my hands. 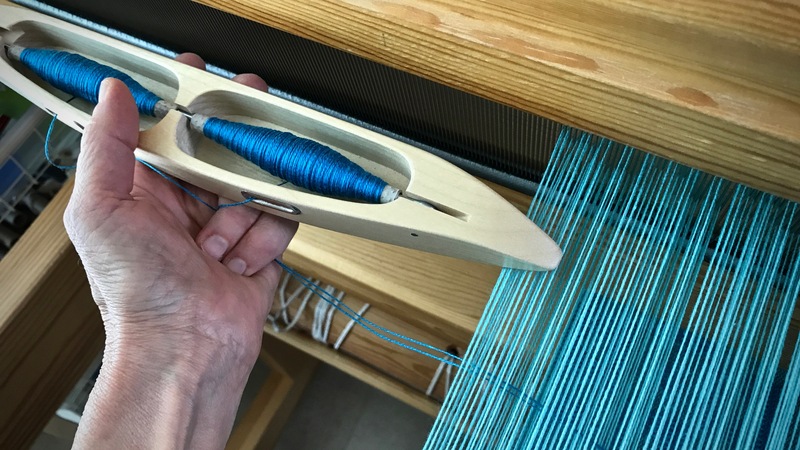 Since that rocky introduction a few years ago, I have woven many meters with my double-bobbin shuttles. They have become cherished tools and efficient accomplices to some of my favorite fabric-making endeavors! Practice. Make sure you allow extra warp length for practicing. You will probably need it at first. Have fun and laugh, and refrain from throwing the shuttle across the room. Visibility of the first wound quill is key for judging how much thread to wind on the second quill. Knowing when to stop is the trick. The ideal is for both quills to become empty at the same time. This only happens in your dreams. But sometimes you can get pretty close. Sending the Shuttle. Sending the double-bobbin shuttle through the shed is the same as sending a regular boat shuttle across. The best release is done with a flick of the forefinger so the shuttle speeds across. 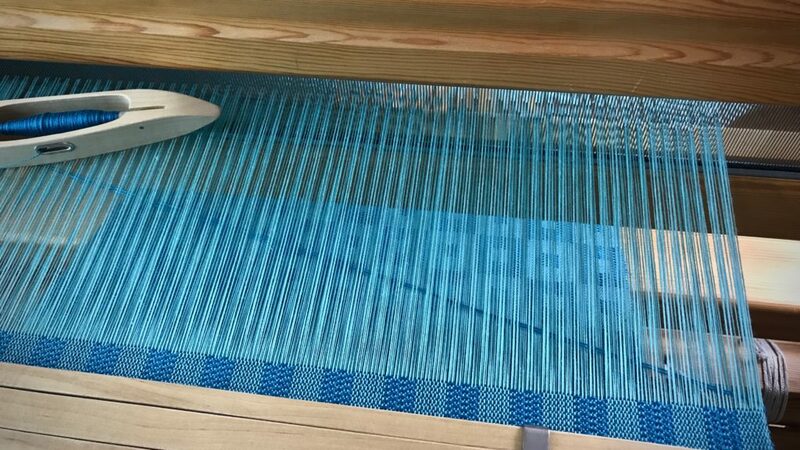 Then, the doubled weft naturally snugs the selvedge, and the two threads are neatly aligned across the shed. With a slower, more timid shuttle send-off, the quills unwind unequally. Holding the shuttle palm up, the forefinger launches the shuttle to glide quickly through the shed. Timid or sluggish shuttle send-off lays unequal lengths of threads in the shed. Deliberate send-off of the shuttle helps the threads to lay across the shed in equal lengths. Receiving the Shuttle. Receiving the shuttle can be the awkward and clumsy part at first. Especially if you are trying to practice a quicker send-off. I catch the shuttle as for any boat shuttle, palm up. And then, if needed, I fold my two bottom fingers around the threads, guiding them to fall equally across the shed. 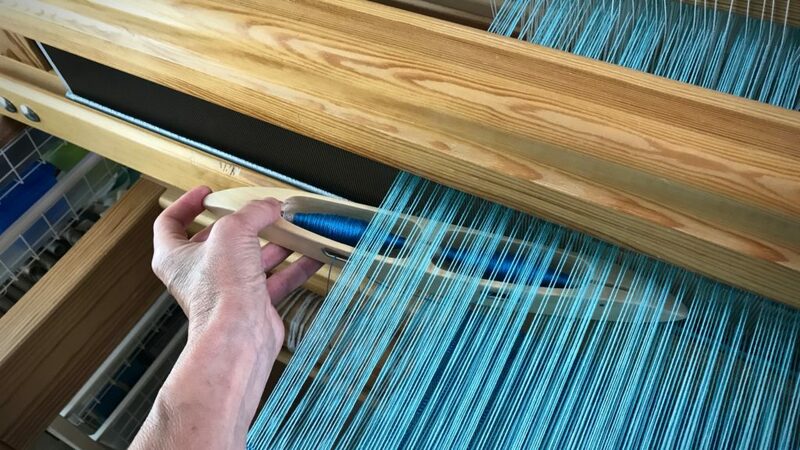 After catching the shuttle, I gently close my fingers around the two threads, as needed, to guide them to fall evenly across the warp. I have a stupid question. 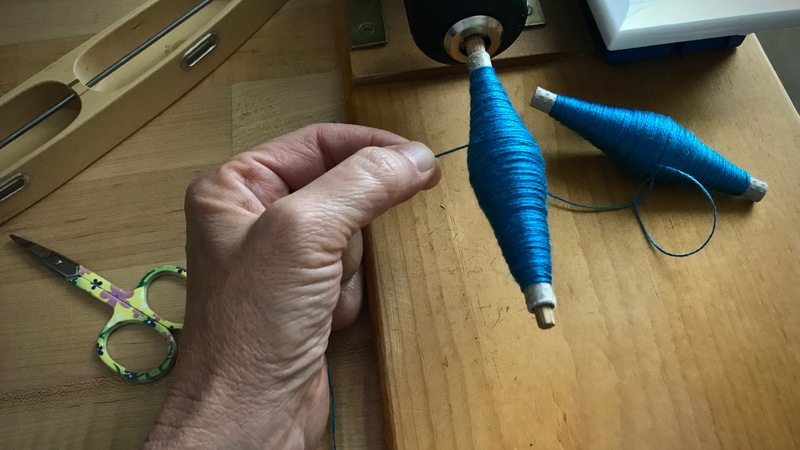 Why do you need to weave with two threads? Why not use one larger one? Hi Debbie, That’s a very smart question! It seems like it would make sense to weave with a larger thread instead of two thinner ones. Certainly easier. But two thinner threads have a way of laying better than one thicker thread, and fill the space better. 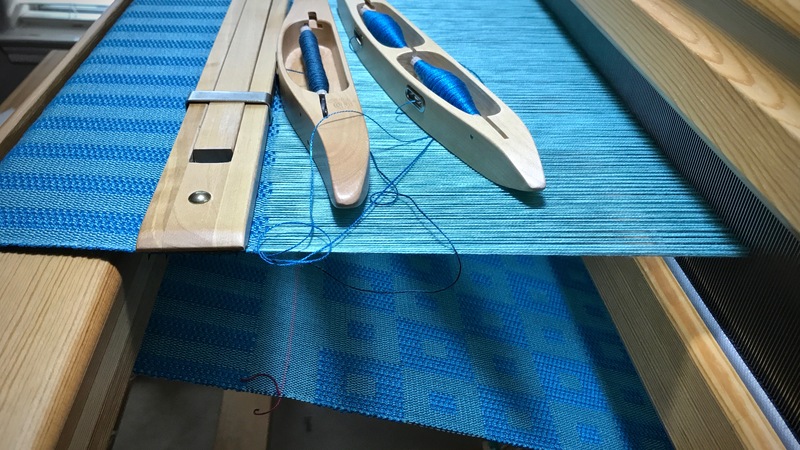 Many drafts with a ground weave and pattern use a doubled weft for the pattern. Part of the difference is seen in wet finishing, too. The combined threads blossom out more than a single thread would.